Here at High Wray Basecamp our mission is to help as many different people as we can to engage with and care for the beautiful South Lakes countryside. We welcome people from all walks of life to stay, and many of them join us in carrying out the vital conservation work that keeps the landscape looking the way it does. We feel that we’re in a pretty good position then, with our wide (and somewhat captive!) audience, to help spread the word about issues affecting the countryside and the wider environment. With this in mind, towards the end of last year, we started thinking about a Basecamp garden. It was an idea that had been in gestation for a while, and a previous half-hearted attempt had at least gone some way to addressing the issue of what to do with food waste. But the ‘dalek’ style composters and the overgrown, fenced-off area they inhabited was unsightly and inefficient. We needed something more in keeping with the environs, and the Basecamp ethos. So plans were drawn up for a garden area that would have multi-functional purposes. First of all it would have a properly constructed and positioned composting area, to deal effectively with food waste generated on site, and to provide compost for our vegetable beds, in which would be grown crops for the benefit of people staying at Basecamp. There would be a small herb garden, again for the use of Basecamp residents. Then there would be a wilder area planted with native wildflowers and flowering shrubs beneficial for pollinators such as bees and butterflies. A ‘bug hotel’ would also be installed to give local invertebrates a helping hand. We also decided to utilise water draining off one of the paths to create a boggy area, and to plant an apple tree, for both blossom in the spring and fruit in the autumn. The whole area would need to be fenced to keep marauding ruminants at bay, and, true to the Basecamp philosophy, we’d put up an interpretation board to let people know what was going on. All this on little or no budget! After returning from the Christmas and New Year break we set about turning these plans into reality. As Basecamp would be nothing without its volunteers, we enlisted the help of some of our regular groups to help us dismantle the old ‘garden’ and start constructing the new composters. We used wood and chicken wire salvaged from the timber yard at Boon Crag to make three adjacent units, large and airy enough to accommodate not just food waste, but grass clippings and some woody material, to provide a more balanced compost. The next stage was to build the raised beds. For these we used wood from NT trees, kindly donated by the forestry team. This was a laborious process, not least because the site was on a fairly significant slope which meant that the beds had to be dug in and levelled. We were lucky to have lots of willing volunteers to help us with this, and with the arduous task of moving a few tons of leftover topsoil from Claife Station to fill them. Once the beds were done and the site was landscaped to allow for the natural slope (resulting in a rather pleasant ‘terraced’ effect we think), we could get on with the exciting task of actually planting stuff. This year we’ve been planting smaller amounts of veg as a kind of test run, but we still managed to plant some spuds, courgettes, spinach, broccoli, peas and beans. We’re using four, fairly large, separate vegetable beds so that we can rotate the crops and minimise the chances of disease taking hold, and we selected varieties that we reckon are going to be hardy enough to withstand the sometimes harsh Basecamp climate. We then sowed our wildflower ‘meadow’ with seeds kindly donated by organisations such as the Bumblebee Conservation Trust and Butterfly Conservation, who do sterling work in addressing the issues faced by these vital pollinators, such as drastic reductions in recent decades of proper meadows. In the middle we planted our showpiece apple tree, a hardy dwarf variety carefully selected for us by the head gardener at neighbouring property Sizergh Castle. We also included some gooseberry bushes gifted by gardener Pete from Beatrix Potter’s Hill Top. In opposite corners we built the herb garden and the boggy area. The first of these was raised at an angle as a rockery, to take maximum advantage of the sun and to provide as much drainage as possible. In it were planted herbs which could be used by visiting groups in their cooking, such as thyme, rosemary, and sage. It’s a happy coincidence too, that most of the plants in this area are also great for pollinating insects. The boggy area is fed by a drain which collects water off one of the paths, meaning that in the wet Lakeland climate it is continually replenished, and hopefully in due course will provide some good habitat for water-loving creatures such as frogs. All that was left then was to gravel the paths around the garden, secure the perimeter fence to keep out the deer and stray sheep which occasionally find themselves in the Basecamp grounds, and construct the bug hotel. This was made from old pallets and materials found around the place, and topped with a ‘green’ roof planted with low growing sedum, to blend in with its surroundings and provide further food sources for invertebrates. Massive thanks then, to all the volunteers and people who donated their time and resources to help us make the Basecamp garden dream a reality. We genuinely couldn’t have done it without you. As the garden matures and develops over time, we hope that it will provide a haven for wildlife, and all the Basecamp visitors, for many years to come. Whilst out on the fells in all conditions we are sometimes privileged with great spectacles in the sky. Often accompanying the various atmospheric cloud formations are halos. 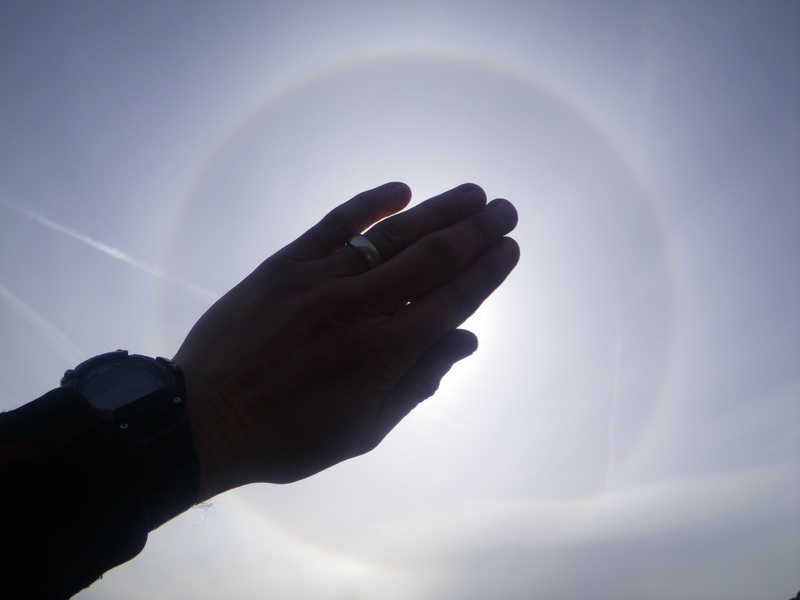 Golden rings have appeared in the sky on a couple of occasions in the form of sun halos. Without being blinded we took pictures and researched what it was all about. 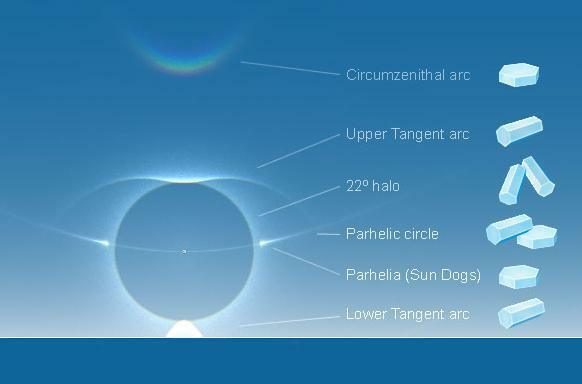 A mix of chemistry, physics and geometry are the main components for sun halos. At high enough altitudes in the sky, the water vapour condenses and then freezes into ice crystals. The ice crystals responsible for halos are typically suspended in cirrus or cirrostratus clouds. As sunlight passes through the ice crystals, the geometry of the crystals cause the light to refract, similar to what happens when light passes through a prism. This geometric size and shape causes light to undergo two refractions, or bends, as the light passes through the ice crystal. Once the second bend is made, the light appears as a halo in the sky. Light from the moon can also form halos. On another occasion whilst working on the fells, the team witnessed an even rarer phenomenon. Usually the halos are formed by one, simple uncomplicated ring. 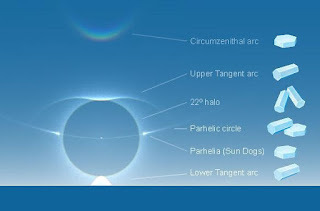 However a variety of halos can appear, caused by a corresponding variety of ice crystals. In the photo above you can see an additional ring starting to form. Diagram of weather halo elements.